Vanswe Adjustable Weight Bench (800 lb.) can be used in decline, flat and incline positions for a variety of resistance training exercises of your upper and lower body and the core section in the comfort of your home. It is rated 4.6 out of 5 stars by 11 customers, which we think is pretty high, indicating a good level of customer satisfaction. It is one of the better selling models at Amazon.com but being recently released there aren’t too many reviews by customers yet. Vanswe Weight Bench is a very sturdy and durable fitness equipment with a triangular support structure and a U type bottom pipe that is claimed to carry up to 800 pounds of total weight yet is not created for commercial gym settings, but home use. 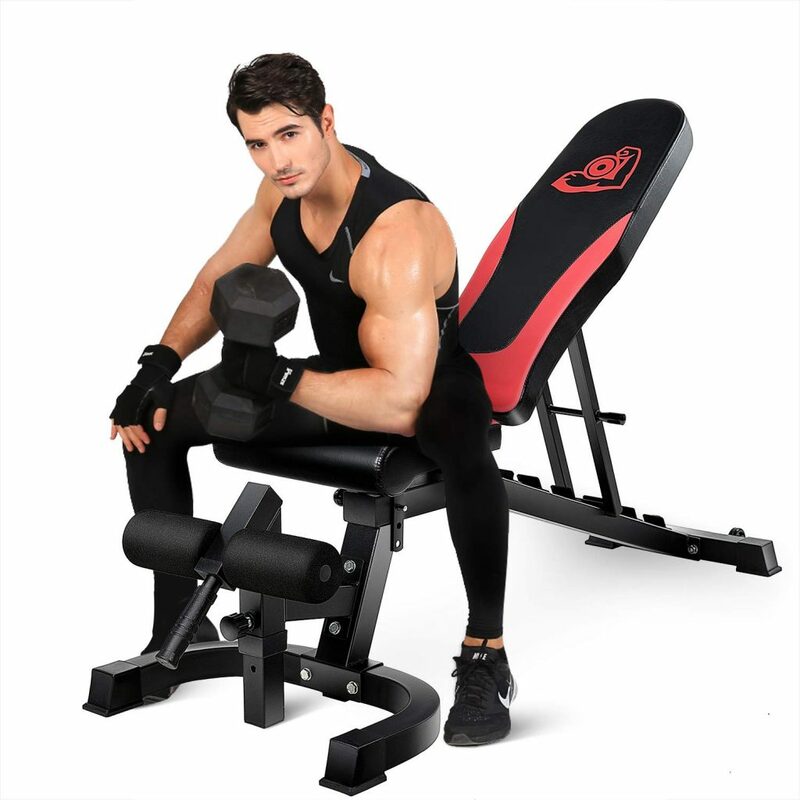 This stable and strong commercial grade weight bench has a 2.8 x 2 inch heavy duty steel frame and 2.3-inch thick back and seat multiple layers pad to offer you support and to make you feel more comfortable. The backrest can be adjusted to 7 different positions/angles of 85, 60, 50, 40, 20, 0, -20 degrees and the seat can be adjusted to three angles of 0, 10 and 20 degrees. So you can use it from -20 degrees decline to 85-degree almost upright military press position. 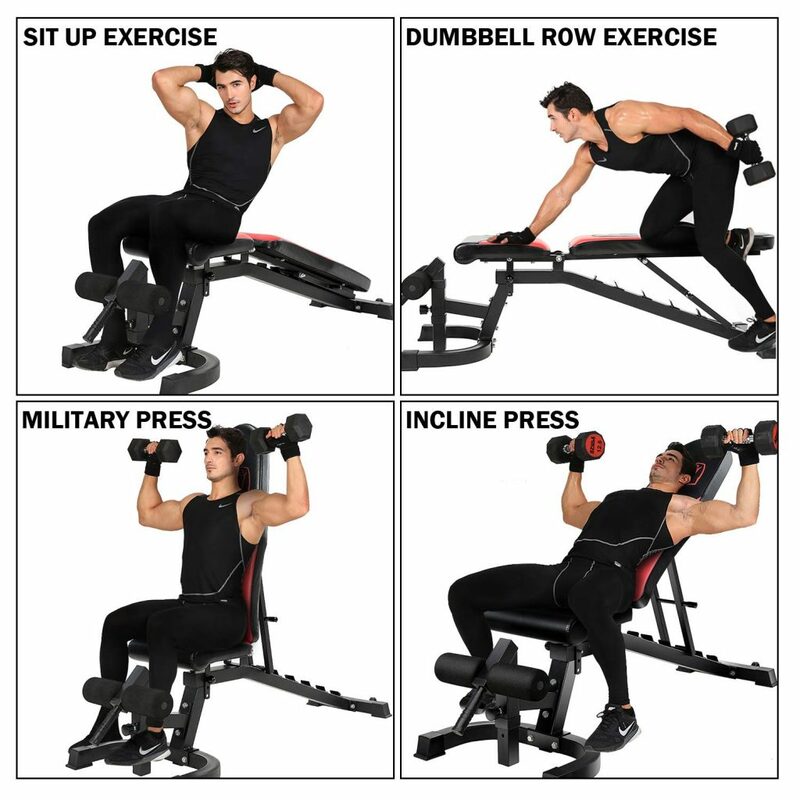 You can easily use this strong and stable weight bench with free weights- dumbbells and barbells, in a power rack, cage or smith machine. When you’re lifting weights or doing body weight abdominal exercises in a decline position you’ll get support from the detachable leg hold-down brace. It is a heavy duty bench that weighs around 51 pounds but you can move it easily on its transport wheels on the rear from and to your workout area. The back pad is 9 inches wide and the seat pad is 13.4 inches wide and both are 2.3 inches thick. The distance between the back pad and the seat rest is 2.7 inches in both decline and flat positions. And we would probably consider the padding as comfortable enough. So you have plenty of support when you’re working out and you’ll be fine if you go for longer. The whole thing measures 61 × 22.2 × 18.1 ~ 50 inches as assembled. You can do incline and decline press, military press, dumbbell rows, sit ups and more on this sturdy weight bench. The ankle support brace rollers can be adjusted to match your comfort level in both decline and incline positions. The padding on this bench is poly urethane- PU material. You’ll see three holes on the leg base where you attach the ankle support. It is shipped unassembled but easy to put together the pieces with the proper alignment of all bolts. The back could be a little wider than 9 inches for better support and comfort. You’ll get a decent warranty of three yers for the solid frame and three months for the pads. It is robust, versatile, easily maneuverable and offer good value for money. You can expect it to last many years over your tough workout sessions. Overall we think it is well worth the money. Please note that you have the option to get the Vanswe FID Weight Bench in all black with a 1000 lb. weight capacity, rather than the 800 lb. of the black and red.